Beregsău Mic is a village located in Timiş county, that only started to benefit from the presence of a Serbian population after the last waves of Serbian colonization, at the end of the 17th century. Today, the village has a population which is mainly of Serbian origin. This is also the place where we find an old mansion, which is not labeled, for now, as a historical monument. When comparing it to other ex-residences from Beregsău Mic, despite its advanced state of degradation, we discover that it was not abandoned, a local woman taking care of it and its owner taking a constant interest in it. Beregsău Mic is documented in existence since 1317, with the name Nemti (Nemti Villa), in 1333 –Nemiti, in 1334 – Nempty, in 1335 – Nemethy, in 1462 – Kysberezo. In the 15th century, the village was known as Nemed. On Count Mercy’s map, the “oiconim” Nemet appears. In the year 1913, the Hungarian administration changes its name into Beregszonemeti (German Beregsău). Along the years, the village was known also as Nemici or German Beregsău, even though the Germans were never a majority of the population.1)Remus Creţan şi Vasile Frăţilă – Dicţionar geografico-istoric şi toponimic al judeţului Timiş, 2007. In 1494, the king donates the village to Nagylucsei Ferencz. In 1514, during the peasant revolt of Gheorghe Doja, the village is destroyed by the rebels and, six years later, King Lajos II donates it to Bolyka Balint. The village is not destroyed during the Ottoman occupation of the Banat area and during the Habsburg occupation it belonged to the Timiş Committee2)Samu Borovszky – Monografia Comitatului Torontal, Budapesta, 1912. In 1788, the Damaszkin Family owned Beregsău Mic. In 1838, the owner of the village was Simon Damaszkin. Since 1880, the village was divided between Gyula Csávossy of Bobda and Szima Mucsalov. In 1912, in the Beregsău Mic there were 242 houses and 1286 locals, a casino, guilds and credit unions. The post office was at Cărpiniş, the telegraph was at Bobda and the train station was at Beregsău Mare. In the same year, the landlords of the village were the heirs of the Csávossy Family, Ivan Mučalov and Badulov Vlasztimivnekand Braniszlavnak. 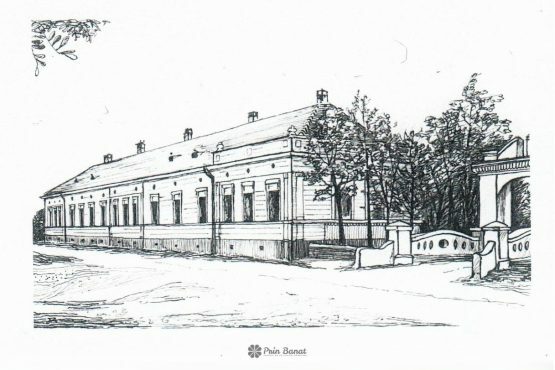 The Serbian church, located across the road from the mansion, was built, between 1855 and 1860 by the Mučalov family3)Samu Borovszky – Monografia Comitatului Torontal, Budapesta, 1912. The mansion from Beregsău Mic was built in 1788 by the Damaszkin family, and was afterwards bought by Ivan Mučalov. In 1949, the property was nationalized and turned into a IAS (collective farm). After 1990, it was returned to the Mučalov family’s descendants, who today are settled in Canada. There is the possibility of participing, if anyone is interested. A bit of money from the lawyer, a bit of money from the client, we have to manage it! We vote for one, then for the other. “My name is Iovanca, but everyone calls me Ivanca. It was a cool name in its time, after Tito’s Iovanca. If you ask anyone of Ivanca from Beregsău Mic, everyone knows me!” Before we left, we wanted to take a picture of Ivanca, but she refused us. “You know what you should photograph? The Triumph Arch. From the street you can’t see it properly, because of the trees, but from the yard you can. Beregsău Mic is located 20 km away from Timişoara and you can get to it on two routes, through the Sânmihaiu German (see map) or through Săcălaz (see map), both access ways being in a very good state. Only a few km away from the Beregsău Mic is the Roman-Catholic Church of Bobda. 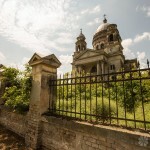 7 comments at "The Damaszkin mansion from Beregsău Mic"
I was most interested by the historical note regarding the Damaszkin Mansion. I am related to the Mucalov family, being married to a great grand daughter of Sima Mucalov and a daughter of Ivan Mucalov (born 1907). We are living in Canada and are closely related to the current owner of the mansion. Lately, I have developed a genealogy of the Mucalov family covering from the early 1800 up to present. I could share it from a historical perspective, Please let me know, if you are interested by this. I read also with great interest many of you other work on the Banat. I would be interested by any historical information related to Beregsau Mic. Thank you so much for writing us! We are glad you found us and that our work on the Banat has aroused your interest. 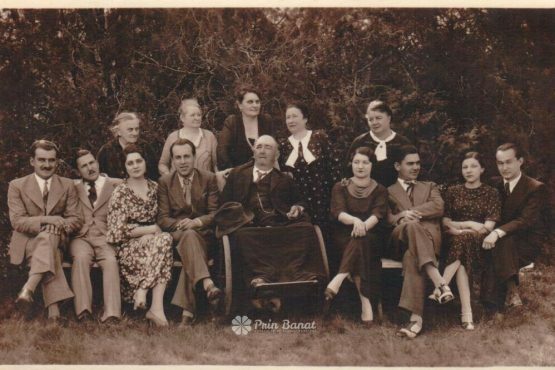 We would be more than happy if you could share the genealogy of the Mucalov family with us. I can update this article with your information or maybe write a new one. Would you accept to give us an interview? Please let me know. Also, I’ll look for all the historical information I own related to Beregsău Mic and write you an e-mail in the following days. Thank you for your for your prompt response. I have at your disposal a copy version PDF of the genealogy, but I do not see in your comment reply form a way to attach my document, and the e-mail address you are using is a no-reply address. Could you give a regular e-mail address or explain to me how to attach something to it (my document is 13 pages long). I have family pictures taken at the Mansion that could be interesting for you, mostly old family portraits and groups taken at divers point of time, as far as late 19 century. As probably, you are aware of, there is a Mucaloy monument in the cemetery in Beregsau mic, at well as, one in one cemetery in Timisoara (the family used to reside in winter in a mansion at 1 Battyany, Temesvar). I have also two texts in both German and English describing the memories of Milutin Mucalov, the last Mucalov residing at the property until 1949 (family historical notes) and a description of life at the property right at the end of the war from Milutin’s wife. Since I was never there and know only thing my hear-say. But it would be better, if that was not done, to interview Simica or Peter who are the sons of Milutin. Both reside in Canada and I could get you in contact my them. Myself,I am residing in Canada (near Ottawa). In may, I will travel to Hungary and I would love to visit Beregsau. If I can organize this, I will let you know. I am fluent in both French and English, can read currently German, but I cannot speak Rumanian. However, I have many good Rumanian friend, I should have no problems to go through Rumanian material. You can send the materials at contact@prinbanat.ro or alexandrapalconi@gmail.com. If you travel to Hungary, Beregsau is located only a couple of hours away from the Romanian-Hungarian border – I would be more than happy to join you. My English is average, but I can translate the Romanian documents that I’ll be sending you about Beregsau. Actually, I’ll continue this discussion via e-mail.